940 East 2nd Street condos lofts is in the Arts District one of the 5 neighborhoods in Downtown Los Angeles. 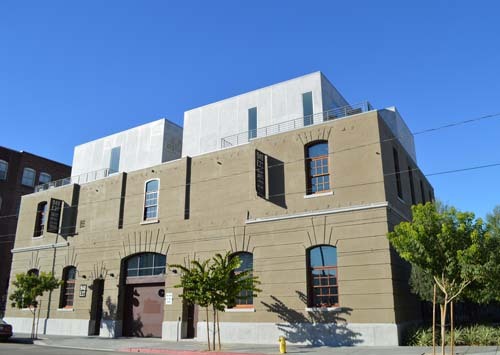 940 East 2nd Street condos lofts are located in an area where artists and urban pioneers have created their homes and studios in the past in what were previously warehouses and industrial buildings. 940 East 2nd Street condos lofts building was Constructed in 1906. This building was modernized by Canyon Johnson Urban Funds & the Borman Group, Rockefeller Partners Architects in 2011. 940 East 2nd Street Condos Lofts is a collection of 38 live/work townhome lofts with historical architectural details with modern interiors and high level finishes. Inside the condos lofts, natural light drenches the original brick walls. The condos lofts have a unique look with its exposed steel beams and vaulted ceilings with a combination of skylights, custom made doors and clerestory windows. All townhome lofts are 2 bedrooms and 2.5 baths occupying three-levels with open floor plans, patios and terraces. Assigned parking is conveniently located directly outside each front door. 940 East 2nd Street condos lofts offers a living with comfort, modernity and style in downtown Los Angeles’ most creative area. Additional units for sale not listed here.